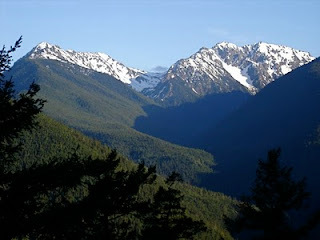 I spent the weekend in the Olympics, hiking with an old friend along a creek, a river and up high on a mountain. 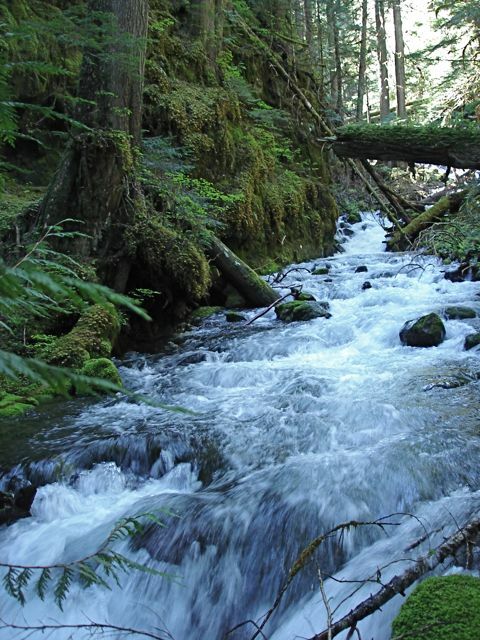 Tunnel Creek, outside of Quilcene, a quiet trail that was being worked on by WTA to repair a washout. Hiked 2.7 steep-ish miles to the restored shelter, then crossed the creek on a bridge and headed up toward Harrison Lake. A steep trail, made difficult and possibly dangerous by lots of hard snow so we turned around. On the way out, I noticed a side trail that looked like it went nowhere, only to discover it led to the banks of the creek. Read more in my WTA trip report. Dungeness River, south of Sequim Bay State Park, where we camped, was about a 45 minute drive with wonderful views of the valley and peaks. We went as a digestive after-dinner hike, going just a mile up the trail, but enjoying every minute of it. The trail along the Dungeness is very open to the sky and follows the bank of the river very closely (sometimes too closely, as there was evidence of flooding along the trail). We turned around at the bridge over Royal Creek, where a trail led to Royal Basin (must do that some day). The trail was smooth and easy, as I wore my Crocs and had no problem. Hurricane Ridge Tourist Trek, the network of paved trails at Hurricane Ridge in the Olympic National Park. The elevation is 5,000' so there is some snow, but on this sunny Sunday, it was soft enough to hike on safely. As the clouds were starting to lift, we were treated to views of surrounding peaks. Plus, we could see the road winding uphill and could spot our fellow cyclists making the climb to the Ridge. Hurricane Hill, another tourist trek but with substance, as you actually have to be out of sight of your car for more than an hour (heavens!) and have to do some ascending. The views all along the way were fabulous, and getting better by the minute, as the clouds continued to lift. 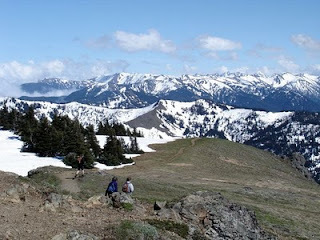 At the summit, there are 360 degrees of views, from Mt Olympus and the Bailey Range, to Sequim and Dungeness Spit, as if you can see all the mountains and valleys. It was hard to take photos, as a feeling of being overwhelmed came over me.